It is just not a repeated disheartening loss for Team India, on foreign soil but also humiliating moment for Cricket Fans of India , lot more than the botherless Team India which does not even care to justify the continuous loss. More importantly, it has given reasons not only to the Media at home and Australia to criticize Indian cricketers but also the Pakistani Media and Cricket Fans. The story does not end there. Reports reveal that Pakistani Cricket Fans are happy about India’s continuous defeat while celebrating their Team’s remarkable win over England. Not to blame them as we are surely cricket rivals, since ages and after Pakistan lost in the last World-cup Semifinals, it got fueled again. It is not easy to digest Indian defeat and to top it if Pakistan seems to be amused about it, hurts all the more. Indian media has been asking Team India to seek lessons from Pakistani Cricket Team. They have surely created an applauding comeback by overcoming all odds and winning against England. Pakistan Cricket Team is the same team which had created news with its key players held guilty in Match-Fixing and it is the same Team which has got back its respect by winning over World’s number One Cricket Team, England on their home-ground whereas India had lost 4-0 in England aswell. Anyone who would have followed the India- Australia Test Series would not deny that Team India never seemed enthusiastic enough to turn matches and the result has humiliated not only Team India but the nation as a whole. 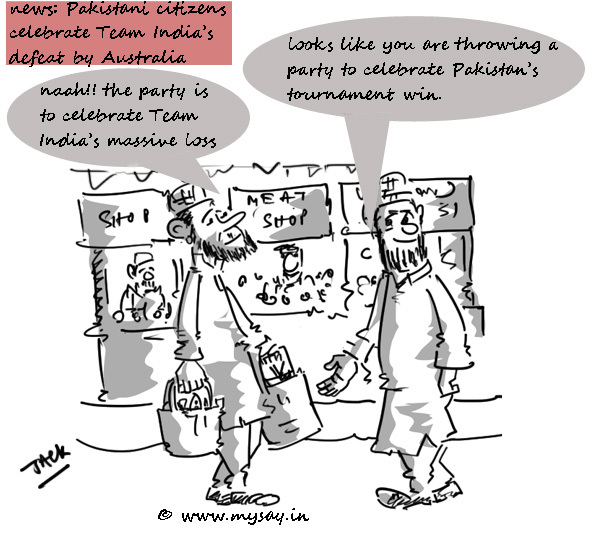 Although Indians might not have celebrated Pakistani players found guilty for match – fixing but Team India’s loss has given Pakistani Cricket Fans sense of amusement, all thanks to our “Tigers Only At Home”, as claimed by Pakistani Media. Indian cricketers are richer than any World Cricket Players and are treated as Gods in the country and even a bruise on their finger is a ‘Breaking News’ in India. In return, these are the same Gods who disgusted Indian Fans. There is no comeback unless India wins the One-Day Series in Australia which all Indian Fans and Supporters can just pray for because the players seem cool about the loss and consider it ‘just a phase’.